The first Stawberry Shortcake, though quickly devoured, did not match the Glen-Mor Restaurant version. To improve we focused on the biscuit, starting with a classic buttermilk biscuit recipe. 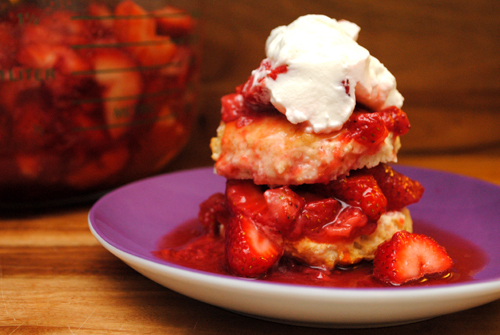 The traditional biscuit was too buttery, but a shortening substitute and addition of sugar resulted in the perfect Glen-Mor Restaurant replica for Strawberry Shortcake. The recipe uses a buttermilk substitute because I don’t keep buttermilk in the refrigerator. If you have buttermilk, eliminate the vinegar and replace the milk with buttermilk. Cut butter and shortening into small pieces and transfer to the refrigerator to chill for 10 minutes. Pour vinegar in a 1 cup measuring container. Pour milk to the 1 cup line, requiring just less than 1 cup of milk. Let stand at room temperature for 5 minutes, transfer to the refrigerator to chill for 5 minutes. Preheat oven to 450 degrees-F. Combine flour, baking powder, baking soda, salt, and 1 Tbsp. sugar. Add cold butter and shortening to the dry ingredients. Use hands to crumble mixture until resembling course crumbs. Make a well in the dry ingredients and pour the chilled milk mixture into the center. Stir with a spoon until batter forms. Pour batter onto generously floured surface – dough will be very sticky. Dust top of batter with flour. Fold dough five or six times, using additional flour as needed to prevent batter from sticking to the surface. Once dough is holding together, form into a 1-inch thick circle. Line a cookie sheet with parchment paper. Cut dough with 2-inch biscuit cutter and transfer to parchment paper. Re-shape dough scraps to form additional biscuits, careful to not overwork dough, should yield approximately 9 biscuits. Place dough rounds onto parchment paper so they just touch. Bake for 15 to 18 minutes or until browned. Transfer to cooling rack to cool. Clean and cut tops off strawberries. Place 1/2 of strawberries (1-1/2 pint) in a large mixing bowl. Mash with a potato masher. Add remaining 7 Tbsp. sugar and mix. Roughly chop remaining strawberries and add to mashed potatoes. Stir to mix. Cut biscuits in half and place 1/4 cup of strawberries and juice on bottom of biscuit. Place top of biscuit on berries and pour additional 1/4 cup of strawberries and juice over top. Add dollop of Whipped Cream.